Barrels can be easily moved by scanning them with the barcode scanner. 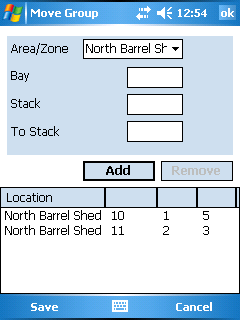 Barrels in a barrel group must all be moved together, you can however move them individually in the web interface if you require. To start off scan a barrel. Once you have your barrel(s) on the scanner tap on the Actions menu, from there you can select Move. This can be done from either the wine or the barrel group on the scanner. 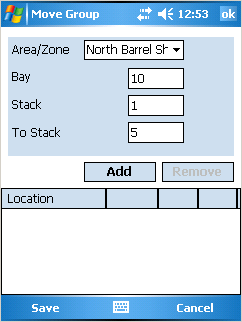 This brings up the Move Group screen on the scanner, you can select the Storage area, bay and starting/ending stacks for the barrels. When you are done entering the information tap Add. 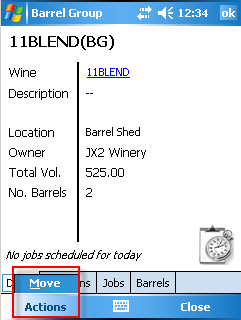 If you wish you can input multiple locations for the barrels, simply enter the information and tap Add again. 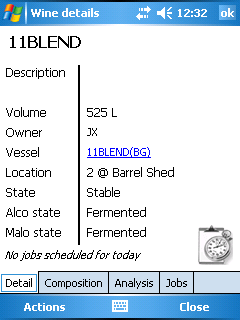 Once you are finished adding the new locations tap Save to move the barrels.